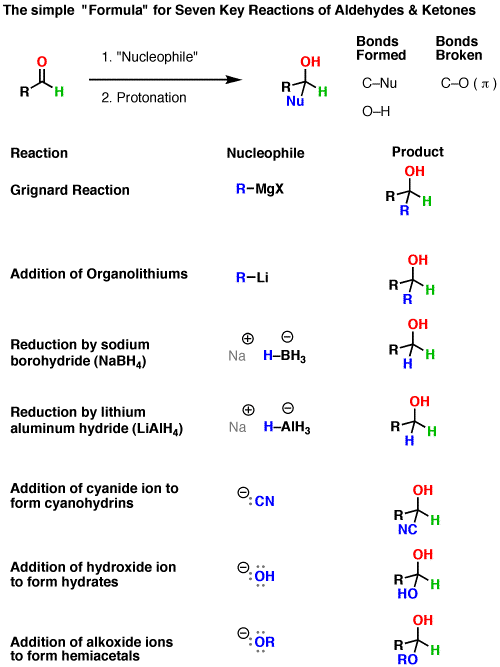 Here’s one thing you’re going to learn about reactions of aldehydes and ketones. There’s a LOT of repetition in the mechanism. You’ll see this in more detail soon, but let’s get a taste of how things work. Imagine you’re a guitar player. And someone tells you that you need to learn how to play 14 songs… ASAP. But what if you then found that each of these songs had the exact same sequence of chords, and only differed in their lyrics? We’re going to go through 14 reactions in this post. BUT… before you run away screaming… it’s really just ONE reaction… that works on both aldehydes and ketones… that has seven different variants. That sounds a lot simpler, right? Addition of nucleophile to the carbonyl carbon. Addition of (-)OH to give hydrates. Addition of (-)OR to give hemiacetals. This works for both aldehydes and ketones (even though just aldehydes are shown here). Apologies – big image. All we’re doing here is changing the identity of the nucleophile! It’s like having a formula, and all we’re doing is plugging a different nucleophile into the formula. Do you see how knowing the mechanisms here is going to make your life much easier? Because instead of having to keep track of 14 different reactions (7 different nucleophiles with aldehydes or ketones) you’re really just learning ONE reaction, with 7 different nucleophiles and two variants (aldehydes/ketones).